Baseball Hitting Practice doesn't have to be BORING! If you coach your child's baseball team, this video will help you run a baseball hitting practice that will give you 5 - 10 times the number of swings as a typical practice and the kids will have fun! 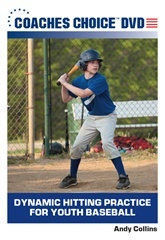 Dynamic Hitting Practice for Youth Baseball is designed for youth baseball coaches who want to work on their team’s hitting skills and techniques in the most productive and time-efficient manner possible during practice. The DVD explains how coaches can effectively utilize both no-cost and low-cost methods to enhance the hitting ability of their players. The DVD also features a series of game-tested hitting drills that can be used to develop the key fundamentals involved in sound hitting. To order your Dynamic Hitting Practice for Youth Baseball Video by credit card or electronic check, click this "BUY NOW" button. If you'd prefer softball to baseball hitting practice demonstrations I have a video where I take the girls through the same drills.